Silver/Nickle Zippers. Make a great impression with our Super Stylish leather jackets, perfect with Khakis or Jeans. 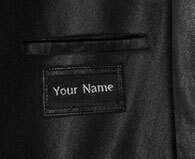 Monogram your name or a message inside the jacket. Max 20 characters on each line.